This month we are glad to bring a number of new and interesting publications on the themes of family farming, the possible effects of the Brazilian Bolsa Familia programme conditional cash transfer programme on women’s autonomy, and gender-related issues in the design of social protection programmes in sub-Saharan Africa. There is also a new study on the social protection reform in Mozambique. We are glad to present the IPC-IG’s new publications and would like to invite you to read and share them with your contacts. The Working Paper “Concepts and realities of family farming in Asia and the Pacific”, by Jingzhong Ye and Lu Pan (College of Humanities and Development Studies, China Agricultural University), analyses the importance of family farming in the region of Asia and the Pacific. Though generally working in small plots of less than two hectares on average, family farmers in Asia and the Pacific produce 80 per cent of the total food needed to ensure food security in the region. The Working Paper "Family farming in sub-Saharan Africa: its contribution to agriculture, food security and rural development", by Sam Moyo (African Institute of Agrarian Studies), analyses the role of family farming in this African region, where 75 per cent of the population is involved directly or indirectly in farming and related employment. This publication is also dedicated to the memory of Professor Moyo, who passed away in November 2015 and was a leading scholar on agrarian issues in Africa and the global South. The Bolsa Família Programme (PBF) currently serves 13.8 million Brazilian families—corresponding to the poorest 25 per cent of the population—combining cash transfers with conditionalities met by the beneficiaries. The programme targets extremely poor families, and, currently, women are the benefit recipients in 92 per cent of beneficiary households, regardless of family arrangement. In the Policy Research Brief “Bolsa Família and women’s autonomy: What do the qualitative studies tell us?”, Letícia Bartholo (Institute for Applied Economic Research—Ipea, and IPC-IG) delves into both qualitative and quantitative analysis to explain the possible effects of the PBF on women’s autonomy and gender equality. This study is available in English, French, and Portuguese. Still on gender issues, over the last 15 years in Africa, there has been an impressive growth in the number of non-contributory programmes targeting poor and vulnerable households and individuals, serving various purposes such as reducing poverty and increasing food security. However, the gender dimension of social protection has received little attention until recently. The Policy Research Brief titled “Gender and social protection in sub-Saharan Africa: a general assessment of programme design”, by Raquel Tebaldi (IPC-IG), seeks to provide an overview of gender-related issues in the design of social protection programmes, based on documental analysis informed by gender-sensitivity criteria found in the specialised literature. It is available in English, French, and Portuguese. The One Pager “Social protection reform in Mozambique and the new basic social security strategy”, by Sergio Falange (Mozambican Civil Society Platform for Social Protection) and Luca Pellerano (International Labour Organization), analyses Mozambique’s recent policy reform to develop a national social security strategy, which started with the approval, in 2007, of a law that structured social protection into three levels, including basic social security. It is available in English, French and Portuguese. We are also glad to share the report “Brazil & Africa: fighting poverty and empowering women via South-South Cooperation”, where the IPC-IG team demonstrates the implementation progress of Outcome 1 of the eponymous project, funded by the United Kingdom Department for International Development (DFID). The document gathers information on all publications produced and activities conducted by the Centre under the scope of the project. The One Pager “The Global Economic Crisis Hampers Human Development. How?”, by Degol Hailu (IPC-IG) is now available in Arabic. The One Pager “Public Policy and Society: Two Essential Mediating Factors for Conditional Transfer Programmes”, by Agustín Escobar Latapí (CIESAS and CONEVAL) is now available in Chinese. On 21 October , Luis Henrique Paiva, Researcher at Ipea, Research Associate at the IPC-IG and former National Secretary of the Bolsa Família Programme (2012-2015), participated as a lecturer in the Social Protection Support Project (APROSOC) course in Angola. The objective was to train the staff directly linked to social support services in Angola, by publicising new strategies and disseminating work tools already in use elsewhere in the world, such as social transfers. The course is part of the activities defined in the agreement between UNICEF Angola and the Catholic University of Angola (UCAN), under the scope of APROSOC. It is being implemented under the coordination of the Ministry of Social Assistance (MINARS ), with funds from the European Union. The IPC-IG is in charge of the design and implementation of the training course. The IPC-IG and the online platform socialprotection.org attended the eight annual Global South-South Development Exposition 2016 (GSSD Expo 2016), held in Dubai, United Arab Emirates, from 31 October to 3 November. With the theme ”South-South Cooperation: Towards Innovation, a Roadmap for the 2030 Agenda for Sustainable Development”, this year’s edition of the GSSD Expo highlights successful Southern-grown development solutions (SDSs) that contribute towards the achievement of the Sustainable Development Goals (SDGs). In this light, IPC-IG' Senior Project Officer Mariana Balboni joined the panel titled “Research on SSC in the Context of the Sustainable Development Goals (SDGs)”, which officially launched the findings of research studies on priority topics related to South-South cooperation (SSC) and triangular cooperation , selected and conducted by think-tanks from the Global South, and identified topics for future research. Ms. Balboni presented the Centre’s work on strengthening the institutional capacities of African governments in monitoring the SDGs via SSC. Read full article here. The online platform socialprotection.org has a full agenda this month, with four exciting webinars. On 18 November, it will host the webinar titled “Sustainable Livelihood Program (SLP) of the Philippines: Linking Cash Transfers to Sustainable Livelihood Development” (register here); The next webinar on “Gender sensitive social protection in the Caribbean” will be held on 29 November (Register here). The third webinar will be “Social protection and the financial inclusion of women in family farming (Protección social y la inclusión financiera de las mujeres en la agricultura familiar”, which will be conducted in Spanish on 30 November (register here). And on 1 December, the webinar “Social Protection and Strengthening Family Farming (Protection sociale et renforcement de l’agriculture familiale”, which will be held in French, will present the Brazilian policies designed to promote food and nutrition security (Register here). Finally, the platform released its Annual Report 2016, which provides a full review of the online platform’s content, major accomplishments and activities carried out during its first year. Read full report here. The IPC-IG participated in the international conference on “Comprehensive Social Protection in the SADC”, organised by the Southern African Social Protection Experts Network (SASPEN) and the Friedrich-Ebert Foundation (FES), in Johannesburg, South Africa, on 18-19 October. The Centre's Research Associate Mario Gyoeri delivered the presentation:"Linking agricultural support programmes to social protection initiatives—Monitoring and Evaluation results of PAA Africa". IPC-IG Research Associate Raquel Tebaldi delivered a presentation on "Gender-sensitive social protection systems in Brazil and Africa: opportunities for South-South Cooperation". The themes of comprehensive social protection systems, social policies and vulnerability analysis were at the top of the event’s agenda. IPC-IG Senior Research Coordinator Diana Sawyer is attending the seminar "Improving the impact of development projects in sub-Saharan Africa through increased UK/Brazil cooperation and partnerships", held in Brasilia, Brazil, on 17 and 18 November. The event was organised by the British Embassy and Wilton Park, the executive agency of the UK Foreign and Commonwealth Office, in partnership with the Alexandre de Gusmão Foundation (FUNAG). IPC-IG Consultant Ana Carla Miranda attended the annual plenary session of the Food and Agriculture Organization of the United Nations (FAO)'s Committee on World Food Security (CFS), held in Rome, Italy, from 17 to 21 October. The CFS is the foremost inclusive international and intergovernmental platform for all stakeholders to work together towards ensuring food security and nutrition for all. The Committee reports to the UN General Assembly through the Economic and Social Council (ECOSOC) and to FAO Conference. The side event "Connecting smallholders to markets", organised by the Government of Brazil, FAO, the World Food Programme (WFP) and IPC-IG, presented the results of South-South cooperation initiatives to adapt the Brazilian ‘Zero Hunger’ (Fome Zero) programme to the context of African countries. Ms. Miranda delivered a presentation on the results of the PAA Africa programme, which aims to implement the institutional purchase of food from smallholder farmers for school feeding. See her presentation here. IPC-IG Research Associate Mario Gyori travelled to Mozambique between 20 and 27 October, in preparation of a new research project that the Centre will develop in partnership with the Mozambican WFP Country Office. 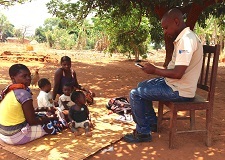 The IPC-IG is responsible for the impact evaluation and the programme monitoring of an innovative Social and Behaviour Change Communication (SBCC) campaign in the province of Manica, which aims at improving the health and nutrition of mothers and children under the age of two. The main objective of Mario’s mission was to train a team of 14 census takers for baseline data collection and to test the baseline survey questionnaire in the field. From 17 to 21 October, IPC-IG Research Associate Pedro Arruda travelled to Zimbabwe to conduct interviews and participate in field missions as part of an ongoing study on HIV-inclusive aspects of African social protection systems. This study covers four countries: Malawi, Mozambique, Zambia, and Zimbabwe, and is intended to document features linking social protection to efforts towards the prevention, treatment, care and mitigation of HIV. During his stay in the country, Mr. Arruda also held meetings with government officials from the National AIDS Council, the Ministry of Public Service, Labour and Social Welfare, the Ministry of Health and Child Care, and several specialists from UNICEF and from different civil society organisations. He also participated in a field visit to pay points of the country' Social Cash Transfer (SCT) in the districts of Zvimba and Bindura, and met with beneficiaries in the district of Chinhoyi.